1 "Good morning, boys and girls. I'm Rachel Scott, the host of Bugs Beyond Belief. Today, we have a very special guest. This young lady seems to be in quite a hurry today, so we'll make the introduction short. 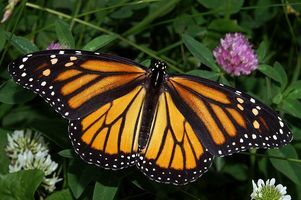 Her name is Mandy, and she's a monarch butterfly." 2 "Hi, Rachel, it's good to be here. I am sorry to be so rushed." 3 "I understand you're a busy bee - I mean butterfly. Why all the hurry?" 4 "Well, you may not know this, but I don't exactly live a long life. When I'm not trapped in a cocoon or eating fast, I'm flying thousands of miles. And we're not talking on an airline, either. It's just me and my wings." 5 "Let's start there, if we can. Tell us about your wings. I hope you don't mind my saying this, but they are really beautiful." 6 "Thanks, Rachel. They're the first things most people notice about me. My wingspan - the distance from the tip of one wing to the other - is about 3 1/2 to 4 inches. My wings are a deep yellow to orange, surrounded by black. The veins on my wings are also black. In the black areas around the edges of my wings are white spots." 7 "Do the male monarch butterflies look like you?" 8 "Mostly, yes, with a couple of differences. Their orange or yellow color is not as bright, and they have a black dot on each of their wings." 9 "So, Mandy, can you tell us a little about where you're from?"